So it has been a while. I have been pondering many things on my mini blogging break. I am currently heavily involved in a knitting obsession, to the point where I left a brunch catchup with friends so that I could go home and knit. How long will it last? The likelihood of a cold snap in Sydney so that I can wear some of the things I am knitting. The necessity of a trip to the Blue Mountains so that I can wear some of the things I am knitting. Have noticed that I am more obsessed with knitting than I normally am. Why is it that the only gay men fight over me? (There is a story here)Should I be concerned that the numbers of gays in my village are increasing exponentially?? Will I ever meet a decent STRAIGHT man?? (that's a rhetorical question, there are many great straight guys out there!). Why is Princess Meena looking at me like that? She is FREAKIN' ME OUT!!! Why am I feeding Princess Meena Greenseas Pink Salmon? Should I just change her name to "She who must be obeyed"? Why do cats and cute little cat clothes not mix?? I love the way my mind works! Makes me laugh..... ALOT!! So here is what I have been working on during my short hiatus. I have just finished 10 repeats of the Forest Canopy Shawl for ME!! ( only 5 more to go!) It has been kind of strange knitting something for myself. I have made a few mistakes, but instead of frogging I have either unknit or just fixed it and left the mistake in there. It is not that I don't care, I think it is because there is no pressure for it to be perfect, I am just enjoying the knitting. Kind of cool really! It has also made me realise that I am obsessively in love with silk. JUST LOVE IT! 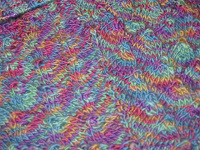 For the shawl I am using Cherry Tree Hill DK silk merino, in the Peacock colourway. I cant stress enough how wonderful this yarn is to knit with. And this particular colourway is DIVINE! Sometimes when I look at it Blue/green is the main colour, and other times it looks purple. It is just simply stunning and I cant wait to wear it! So this weekend I will have another finished object to show you all. I cant wait!! OMG!! I have been contemplating the exact same things (except for #5 - no men have ever fought over me!!). I am almost prepared to move to Canberra in order to have more cold weather!! I thik I see pinks and aqua in the shawl. But it may just be my monitor. You're such a finisher completer at the moment! I don't see any green in the shawl though - just blue, purple and red/pink. Weird, eh? The shawl is looking just gorgeous! If Princess Meena keeps acting up and bossing you around, just make her look at this web site! Good luck on the guys front - my Dotter also has problems at College (Year 11 & 12), all the guys are either sports jocks, pot heads, gay, or rabidly Christian. Most of her male friends are gay! Finally it is the Weekend!